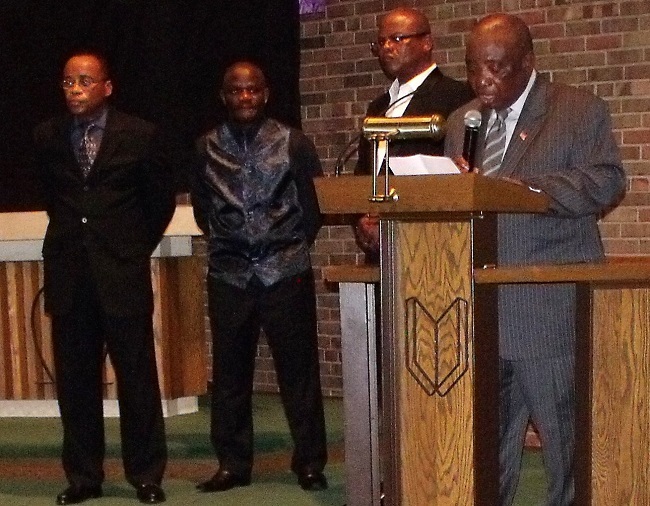 At the Cross of Glory Lutheran Church located on Brooklyn Blvd, Brooklyn Center, Minn., one of several Christian worship centers for African-Liberian Americans, words proved inadequate in describing the true personality of a youthful Liberian official, Lee Sonny Mason Sr., who died in the US about one month ago during a brief visit; writes James Kokulo Fasuekoi. Saturday, April 4, marked the initial funeral service and the celebration of Lee’s life, to be followed by another this month in his native Liberia. It was a tearful moment for both the old and young-many came from across the United States and with one thing in common-their lives somehow had been deeply touched by that of the former Assistant Minister at the Liberian Ministry of Finance, Development and planning, whose illustrious life ended suddenly at age 43, without much warning. But more difficult it was especially for the deceased’s adorable nephews and nieces who sobbed during much of the funeral service. 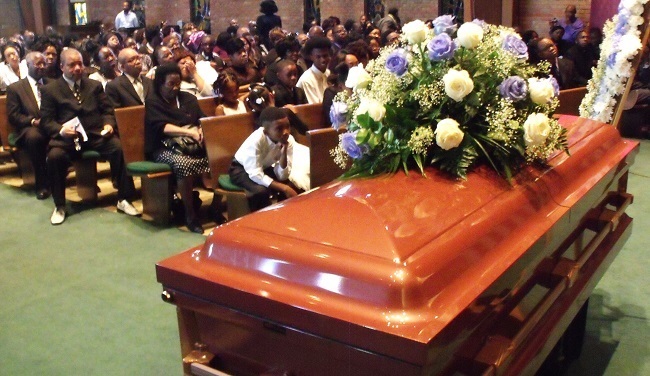 In one instance after the kids had gathered on stage to render songs of remembrance in honor of their late uncle, they all stood still next to the coffin, unable to sing. They were visibly touched by the tragic death of their uncle, a man it is said, spent quality time not only with his biological children, but also with nephews and nieces, something many fathers and uncles can’t afford in today’s busy world due to hectic work schedules. Seeing how emotional it became for the children who were mostly between the ages of 7 and 14, their uncle Mr. Joe S. Mason, senior brother to the deceased, moved slowly toward the stage and cued them to leave till later. Even after they reappeared, one by one, each tearfully recounted the loving kindnesses of the deceased through poems and special tributes. Making tribute to his late brother, Joe Mason, a former broadcast journalist at the Liberia Broadcasting System (LBS) said that the former Ministry of Finance and Development Planning official was someone who always aimed high and never wanted to settle for something less and wished that Almighty God had spared his brother’s life so he could be there for his family as well as pursue his dreams. He described the late Mason as one of the best brothers, husbands that anyone could possibly think of in life. 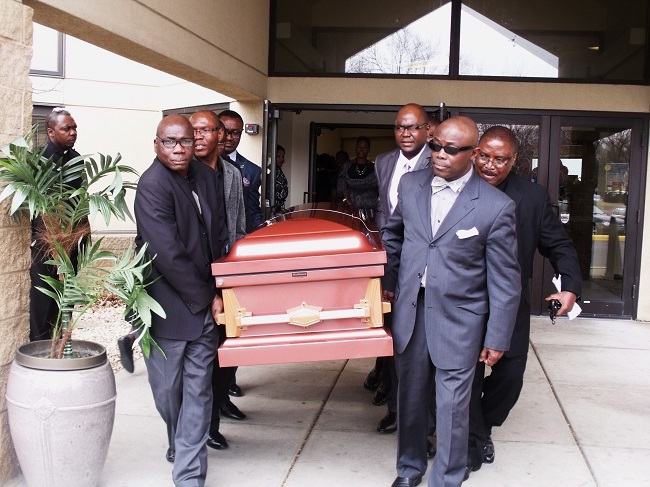 “He was the best brother you can possibly think on; he was the best husband you can possibly think of…but we thank God for everything,” said journalist Joe Mason who is Minnesota Coordinator for the Association of Liberian Journalists in the Americas (ALJA). Taking into account how inseparable Lee and his children became, elder brother Mason reasoned that no one else can provide Lee’s wife and kids with such abundant adoration, not even him. 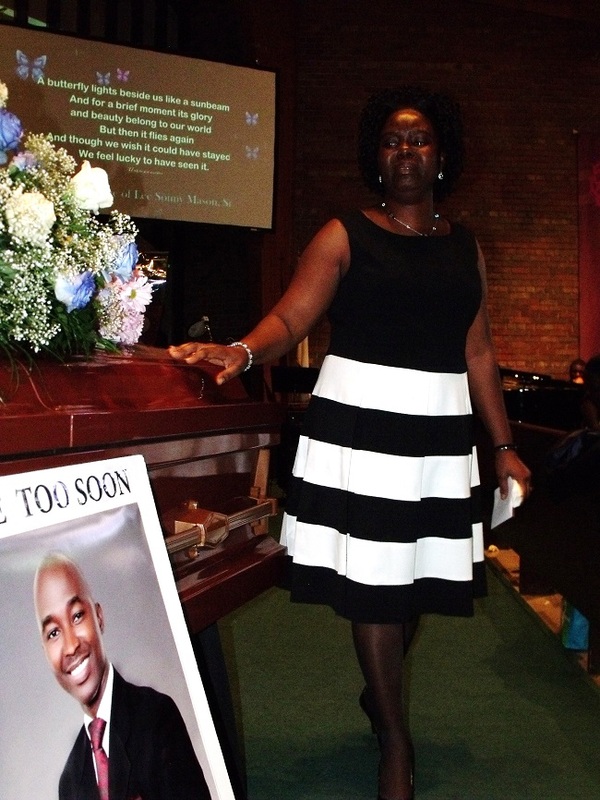 The former newscaster told mourners of how he initially approached his brother’s death news with a sense of total denial, an experience that is not uncommon with many after the death of loved ones. At first, he said, he thought it to be a joke and pretended someone or “Lee himself” was going to call sooner or later and “admit this was all joke, and then apologize” with a promise that his brother Lee was on his way to meet him. With this belief he even went several times to the basement of his house, a place Lee loves to stay when visiting, saw the deceased’s family photographs on the walls, and stared through the windows, in the hope he would receive a phone call from his brother but no call came through. It was agonizing for him and he couldn’t help but asked: “How can this be true?” It took him days before reality began to set in. Even now, like the rest of the Mason family, Joe Mason said he’s yet to get over Lee’s death. For the deceased’s wife, Mai Bollie Mason, her situation wasn’t different from her brother-in-law’s as the sad news was too much of a grief to bear, looking upon the couple’s young children, 4 year-old Lee S. Mason Jr., and 2 year-old Garmonee T. J. Mason as well as the good time they had together since they became united. Unlike many who may never be lucky enough to meet their rightful life partners, Mai Bollie Mason felt blessed to have Lee Mason as a husband. “Lee was the type of person I was praying for in life and God brought him to me,” she told grief-stricken mourners who had gathered in their hundreds to pay homage to the youthful Liberian minister. Late Lee, she said, was a “caring, loving, but most of all, intelligent” husband she came to know. Days after her husband’s death, she said, she sat thinking and tried to figure out any wrong that Lee may have done to her that annoyed her but found nothing. It was a statement that had many of the mourners of both sexes inwardly re-evaluating their earthly personal relationships with their partners and those around them. visited his wife and two little children who, like scores of Liberians, had been forced to escape Liberia after the deadly Ebola virus churned the nation and left thousands dead in the West African country. The death news of Lee was passed on to his elder brother living in Liberia, Mr. Elijah Mason (who largely depended upon his brother, Lee, for assistance) and barely two days passed when Elijah, too, fell and died (Monday, March 9,) due to an apparent heartbreak. 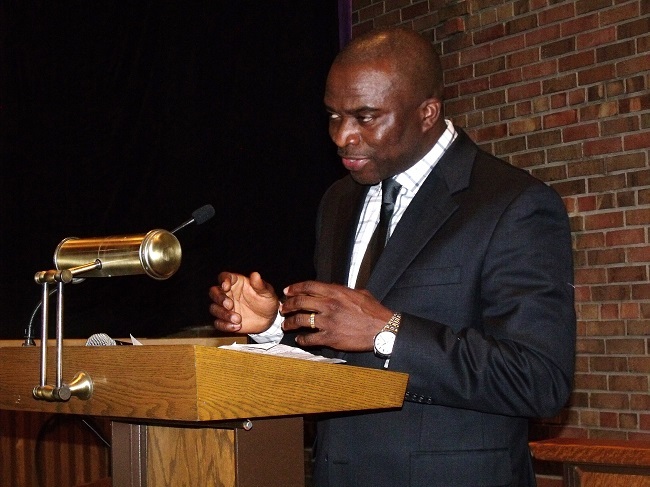 Pastor Saah described the late Mason as his best friend and a true Christian who stood for principles but according to him, in present-day Liberia, unfortunately, “When you are a Liberian who stands for principles people hate you.” Lee Mason, he said, often hosted him whenever he visited Liberia. Besides, Lee would prepare his Saah’s favorite stews (soup) and after meal, they both would hang out. Their friendship began when Lee Mason served as secretary general for his Pastor Saah’s Faith Chapel Evangelistic Ministry years ago before Lee Mason decided to move to Liberia to serve his country. Pastor Saah spoke on the theme: “What Happened?” with a focus on the following chapters of the Holy Bible, Luke 12:13-14; John 5:24; Hebrew 12:1-2 and 2 Corinthians 4:16-18. In countless tributes, relatives of Lee, former schoolmates, co-workers, friends, as well as representatives of organizations he worked for prior to his untimely death, all spoke highly of his honesty, love, smartness and ability to work in harmony with others. A Lutheran World Federation/World Service representative recorded during a tribute that Lee was a person full of life and fun and often loved to swim, play volley ball and sing for peers while on the job. Lee, the LWS representative maintained, amused them at times with gospel songs whenever they had a lull in their relief operations during the war years when they all worked together with the relief agency to provide humanitarian aid to destitute displaced people in the Gbarnga, Bong County region, once a stronghold of Mr. Charles Taylor’s rebel National Patriotic Front. Now many of them can only look upon those days with a sense of nostalgia. Weeping profusely for the loss of his friend, Johnson, in a forceful manner informed everyone that “I sent $30.000 [US dollars] to Lee Mason in Liberia so he could build me a house and he didn’t take out a penny.” His remark received credits from the audience immediately for such good gesture all because, in the post-war nation, the chance is that one will probably hear such good news 1 in every 20 to 30 cases. Since the country emerged from the ashes of a brutal African war more than a decade ago, many Liberians back home continue to find themselves at loggerheads with their brethren living overseas often as a result of betrayal by some who lure relatives residing in places such as the United states and Europe, into wiring them money with promises to build decent homes for them but would instead divert such funding into their personal use. 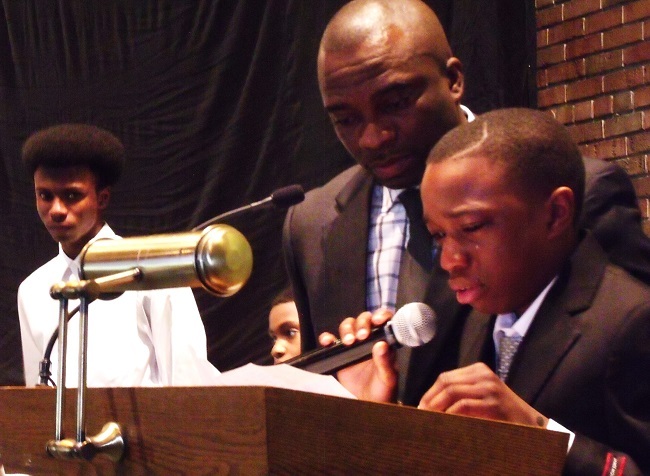 The journalists union described both Lee and his elder brother, Elijah, as Liberians who “lived an accomplished life,” noting, that “their deaths were not in vain; [that] they made an indelible impact on the lives of Liberians and the Mason family.” As the statement was read, active and none-active journalists, including Messrs Edward Carter (former City Mayor of Pres. William Tolbert’s hometown, Bentol, Liberia), Kirkpatrick Weah, a Liberian community based social-political activist and fan of “Independent journalism,” along with this writer, stood by Kugmeh, next to the coffin. The late Lee Mason was a senior in high school when the bloody war struck in the 90s. He graduated in the middle of war 1994 from the Monrovia College & Industrial Training School on Camp Johnson Road. He later obtained a BBA in Management at the University of Liberia. Thereafter, his work paid off, taking him to great places of the world, among them, Ghana, Zimbabwe, Thailand and the United States during which he participated in conferences and trainings. Having worked 12 years for Lutheran World Service and four years with a German relief firm named Diakonie Emergency Aid-Germany, Lee Mason moved on to work for the government of the Republic of Liberia in 2009, first serving as County Development Officer under then Ministry of Planning and Economic Affairs, for his home region of Bomi County. He would later excel to various positions at that ministry including Acting Assistant Minister for regional planning as well as National Coordinator/UN Focal Point at Ministry of Planning, before being appointed Assistant Minister for Regional & Sectoral Planning at the Ministry of Finance/Development & Planning July 2014, by Liberia’s President Ellen Johnson Sirleaf. The body of the deceased is expected to be flown to Liberia in the coming weeks where additional funeral rites will be carried out over his remains by the family and government of Liberia before interment.